I tweeted something a few days ago about queues and MySQL. MySQL is not a data queue. MySQL is not a data queue. MySQL is not a data queue. MySQL is not a data queue. MySQL is not a data queue. … and I got a few confused looks, largely because you can use MySQL as a data queue (as in it is possible). So here, now, I will explain why I said that MySQL is not a data queue, even though it can be used as one, and also why you should use a queue instead of MySQL if you need a queue. Actually, it does not. MySQL does not do communication. Its intention is not to provide communication. It is not about communication. It is about data storage and retrieval. And so, class, what is a word that can describe a computer science scenario where there is a mismatch between intention and use? That’s not to say that you can’t do it, only that you’re doing it wrong. And, truthfully, there are times when it is OK to do it wrong. But don’t pretend that you’re doing it right. Instead, the proper approach would be to say that you had a choice between different options and you believed that the anti-pattern provided more value. You won’t find me complaining about people who use expediency when expediency is necessary. Yes, but let’s look at the typical implementation of a queuing system in MySQL. Umm, that ain’t asynchronous. And not only that, it is blocking. Two problems right out of the box. But!! You have a fix!! And now you have three problems (I don’t even know if the example will work. It’s meant as a joke). The third problem is that now you have to manage the queue items. You will need to manage handling error conditions if one of those jobs does not execute properly. And this will be difficult. Just proved me wrong, eh? OK, what happens with this code? That, friends, is what we call a fatal error. I hear you saying that you will catch all those. You might (you won’t, actually), but not everyone will. And then your queue will be in an inconsistent state. Yes, I’m sure that you will also add a timestamp on there and if the job hasn’t finished executing after 30 seconds or 5 minutes you will retry it. Well, you’ve just significantly increased your feature set. Additionally, what if the job runs 6 minutes? How will you know when the job has finished or if it’s crashed instead? IPC? TCP communication? Whew! This is getting deep. The consumers are able to process data as they are able. They are not bound to a specific schedule. 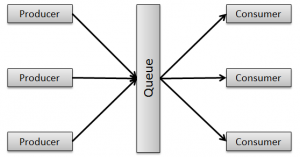 One of the great features of a queue is that it gives control of data processing to the infrastructure. One of the key, though perhaps unsaid, tenets of a queuing system is that it processes data when it is able. That smooths out CPU usage, which is good. If you are waiting a minute to get a batch of operations to execute you have lost a minute of useful time on the CPU. This is your system on a MySQL-based queue. In addition, your system may have dependencies that cannot wait or that would impact UX while they had to wait. Say, for example, a “forgot password” link. Say you put that into a queue in MySQL that is managed by cron. Your customer will be waiting at least a minute, perhaps longer for that email during which time they may decide it’s not worth it or go on to doing something else. It may not go out at all if some other previous job takes too long or crashes. Sendmail is a queue!!! It is an SMTP-based message queue. In other words, every job is just another job. You can’t say that a job of type X can have 20 workers and a job of type Y can have 2. You could add a column to the queue table that has a priority on it and sort on that, but what happens if another job is inserted after the SELECT occurred? Then the queue items are getting processed out of priority order. Compare that with a message queue where, as I noted earlier, you could have 20 workers on an important queue and 2 workers on a less important queue. All you have to do is spawn more or fewer workers and you have your priorities defined right there. Why should you use an actual queue? Or perhaps, more accurately, when should you use an actual queuing system? I have some deliverables that need to be delivered and so I’m just going to stop right here. But if you are using MySQL as a queue you might actually be doing the right thing. MySQL can be used in this way. BUT! Compare the very minimal feature set of any queuing system written using MySQL with a poorly copied, truncated list of features for ActiveMQ (my personal favorite). Sometimes it’s tough for web developers (particularly of the PHP sort) to drink the queuing Kool-Aid, but once you have you find that there is a world of opportunity. 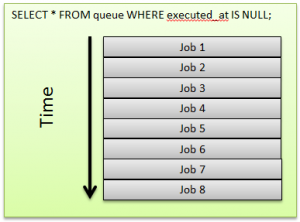 The biggest advantage of building a job queue on top of MySQL is that you can enqueue jobs transactionally as part of the same database transaction. So after you enqueue the job, if the transaction fails and rolls back later in the code for some reason, your job would get rolled back as well. OK, but if a job depends on a commit why wouldn’t you just send the message after the commit? No worker process will see the job until the commit anyway.